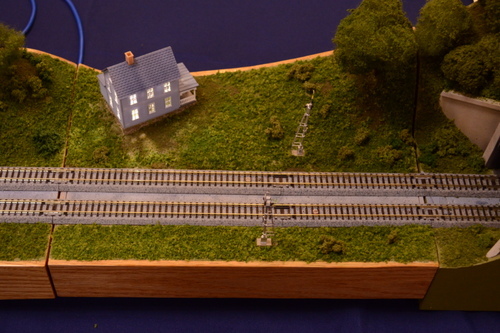 Description: single straight module with semaphore signals, farmhouse, and lighting effects inspired by this. Power feeders may be attached to terminal strip on underside. Natural-finished oak fascia. This module may be used individually, or as part of a scenically-contiguous set with the Little Chenango River Bridge and Cryptic Creek Tunnel modules. Semaphores are part of the GVC signalling project. Old-timers should be able to guess who the module name pays tribute to.